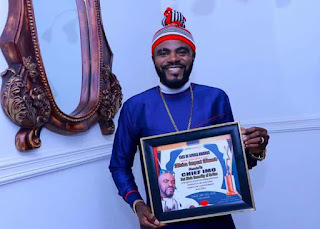 Owerri is agog as dignitaries across Nigeria and Africa will converge in Owerri the State Capital of Imo State during the grand Finale of Face of Arise Africa beauty Pageant slated to hold in the month of July 2019 at the prestigious Rockview Hotel, Owerri. Speaking with the Publisher of Arise Africa Magazine Mr . Ikechukwu Anyanwu who is also the CEO of Sommies Ltd, Gcfn Consults, he further affirmed the readiness of the group to deliver a world class event set to redefine pageantry while attracting local and foreign investment into the Imo State tourism sector. The leadership blogger further explained that, ‘Face of Arise Africa beauty pageant is one that primarily focuses on harnessing the potential of womens while also exploring his capacity to lead an army of achievers in addressing some of the challenges bedeviling the Nigerian society through charity and volunteer work. The Face of Arise Africa beauty pageant is designed to raise confident, elegant and inspirational women who would use the power of their inner strength and character to provide solutions to some of the challenges facing our country Nigerian’ he said. Face of Arise Africa beauty pageant has long valued community service, and it is our basic requirement that each contestant from anywhere in Nigeria must champion a social issue that is important to her but one that meets the need of humanity. Face of Arise Africa beauty pageant has categories (Miss, Mrs. & Ms.) for every woman, because we believe every woman has a unique voice at any stage of their life. Our pageant is built on the understanding that women are catalyst to national development thus the need to create such a platform whose mandate amongst others is to build confidence, inspire hope, empower through entrepreneurship skills and groom women into agents of social and economic change. 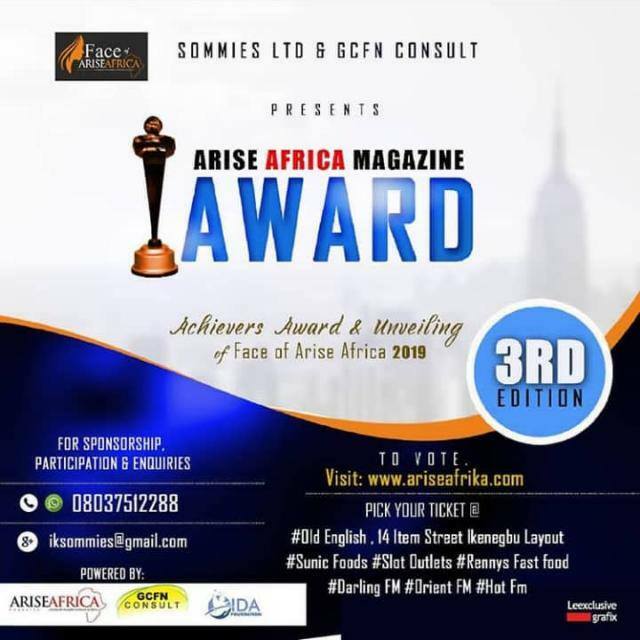 The grand winner will go home with a cash reward, cover page on Arise Africa Magazine, Holiday Trip Outside, Represent Nigeria in International competition . Our pageant will also impact various skills to the contestants like: Creative skill, interview, fashion, sportswear, & evening gown. There will not be any bikini show or indecent dressing. Face of Arise Arise Africa beauty pageant is a glitzy event that focuses on equipping all contestants with life skills but however only selects and presents only the best among the contestants who will emerge as queen for each of the categories transparently setting the pace for excellence within the industry. Application is now open, kindly call the following numbers; 08037512288, 08178497715 or send email to iksommies@gmail.com if you wish to participate. We believe that hosting the competition in Owerri Imo State will be a great medium to promote and present Imo State to the rest of Nigeria and Africa. Even as we focuse on stimulating and diversifying our economy, tourism and hospitality will certainly be a great alternative, it is expected that cash flow into the State will be improved. In addition, national and international trade including foods, consumer goods, and service will be supported, and African culture will be divulgated to viewers and consumers worldwide.